“The Rooster” by William Jauquet. Egg Harbor is proud to unveil the latest piece of public art to be installed within the village. 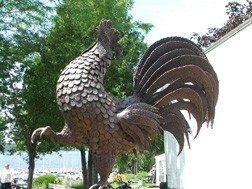 William Jauquet’s steel sculpture “The Rooster” graces Harbor View Park, located in the middle of the village, adjacent to the marina. The piece, valued at $18,000, was installed this past August and has created a buzz amongst villagers and visitors alike. Jauquet began his art career as a rural folk carver, becoming nationally recognized in only a few years. He started woodcarving in 1978 and was honored with a one-person show in Washington D.C. sponsored by the Museum of American Folk Art. He began working in bronze in 1986, using the lost wax method of casting bronze. Jauquet casts his studio bronzes in his own foundry near Green Bay. He does everything from design to sculpting to casting and finishing. All of his studio bronzes are one-of-a-kind with a chemical patina and hot wax finish. Beginning around 2007, Jauquet began working in welded steel. Many of his metal sculptures can be seen in the Edgewood Orchard Galleries sculpture garden, located in Fish Creek. For more information, contact Village of Egg Harbor Administrator Josh Van Lieshout at 920.868.3334.